Want to know if Atlanta is a City where Mortgage Payments are cheaper than rent? Tune in to Atlanta Sports X on Saturday at 11am – 106.3FM/1230AM – and find out! 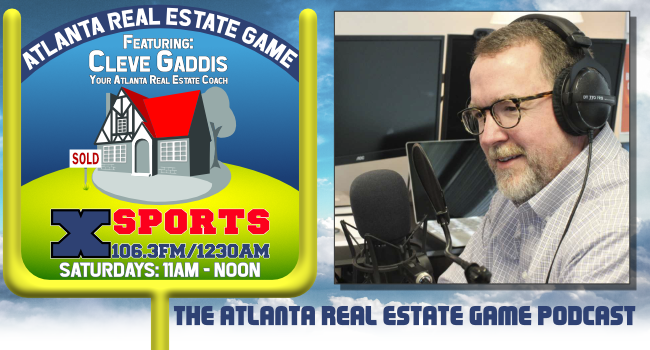 Cleve Gaddis will also be giving away a $100 Starbucks Gift Card on The Atlanta Real Estate Game! Learn about the 2019 Top Suburbs in Atlanta, the Cost of NOT Buying a Home, and what to Avoid after applying for a Mortgage. Join me as I speak with Stan Poss, an expert inspector & answer your questions, ranging from updating your home to lot line disputes. Real Estate is changing FAST & you need to be kept in the know! Cleve answers questions from listeners about polybutylene plumbing, painting your brick, and chat about the difference in APR and interest rate. Don’t miss the chance to win Braves Tickets while listening to The Atlanta Real Estate Game!